The medieval images of the Tree of Jesse combined Isaiah’s prophecy with the gospel account in Matthew 1 of the descent of Jesus from the royal line of David. Saint Matthew’s gospel is read on Christmas day. Families also may read this chapter together on Christmas eve or Christmas morning. It was a very popular subject in medieval art. Examples of the Jesse Tree image survive in carvings, manuscripts, stained glass, and even on embroidered vestments. The “tree” often appears to be a vine springing from the side of the sleeping figure of Jesse, the father of David. The “rod” (trunk) represents the biblical genealogy of Jesus, culminating in Virgin Mary. The “branch” (or flower) is Christ the Savior. These images often depicted King David holding a harp, and King Solomon holding a model of the temple at Jerusalem. Sometimes other figures  from the Old and New Testaments  were included among the side branches. 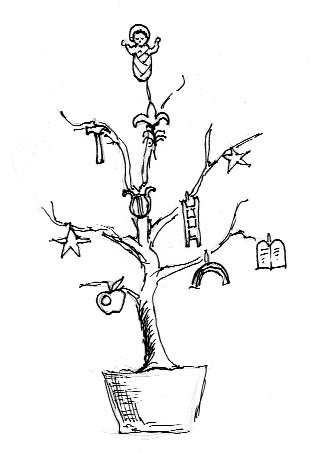 The Advent Jesse Tree, a fairly recent innovation, was developed to help Catholic families “put Christ back into Christmas” by studying His genealogy. It has often been used in schools as well as in homes. The ornaments placed on the Jesse Tree represent the ancestors of our Lord, Christ Himself, Old Testament foreshadowing of Christ’s sufferings, and Old Testament personages who prefigure Christ’s life and His coming. A home Jesse Tree may be a small bare or evergreen branch set in a sand-filled flowerpot or decorated coffee can. A tree could also be made of felt, poster board, or wood (buttons or bells could be attached to hold the ornaments.) The tree is ornamented with a symbol and/or a Scripture verse for each day of Advent. A list is suggested below, but there are many additional possibilities. During each evening in Advent, a child may place a symbol on the tree. The child (or an older child or parent, if he is too young) then reads the appropriate Scripture text and explains its significance in Salvation History. Twenty-seven suggested subjects for the Jesse Tree are listed below, along with symbols and Scripture text citations. You may need more or fewer, depending on the length of Advent in a given year. The final eight days are the same every year, and the last symbol placed on the tree, of course, is always the Infant Jesus, the newborn King.